We made some real progress on the tiling this weekend. Managed to lay another 45 tiles. Linda was doing a yoga training course on Saturday, so we arranged to work together on tiling on the Sunday. I had planned to go out to site on Saturday evening, do the first coating on the shower and then stay overnight. However, with a severe storm coming in, I wimped out, stayed home and watched television in front of the fire (poetic license here). Instead I headed off early Sunday morning, arriving on site at 6.30 am. I must admit, it's a relief to have my utility working again - I just had the transmission rebuilt and I no longer need to drive 10 km on the back roads, in first gear, until it starts changing up. In keeping with last night's theme, I had a coffee and read the newspapers until 7.00 and generally avoided getting started. I think I had a bit of a phobia with tiling - I was afraid of making an obvious mistake that will be permanently on display for the next 30 years. I don't really know what happened to the next three hours. 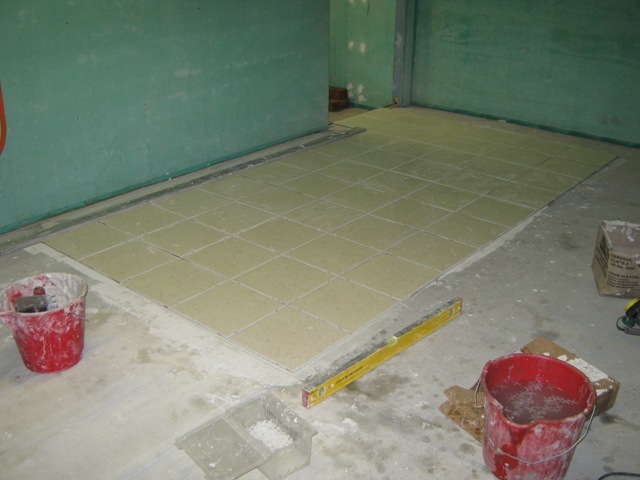 I used the chalk line with a brick holding down one end, and me at the other, to grid up some more tile positions. Then I realised that for some of the lines I had worked off the wrong datum - so had to erase the chalk lines (with a broom) and repeat the exercise. I was expecting Linda at 10.00 am but she spent a lot of time waiting in a queue to get me a take away coffee (bless her thoughtfulness) and didn't get out to site until 11.00 am. In the meantime, I did a little bit more work on patching up the vanity cabinet - it's going to look pretty "mint" after I give it a coating of gloss paint. When Linda arrived, we had another little coffe break (I think you can see today's theme now - creative avoidance) and then made a start. We have now swapped over to ordinary cement based adhesive - so there was a bit of a delay understanding the instructions. Last week, we had to follow very precise mixing ratios (and consequently this week we had brought along kitchen scales and a measuring jug). This week, the instructions merely said "mix to a smooth creamy paste" - so a bit of experimentation was needed. One thing I did learn was never put the powder in first. It just sits there as a layer on the bottom of the bucket. Anyway. At this point we committed ourselves to laying some more tiles. Linda's theme this week was to stop agonising over every millimetre and get on with it. Last week, I had been obsessing over the level of every single tile. From advice, it turns out, that all you do is lay a spirit level over three tiles at a time and bring them in to general agreement. Looking at the bathroom tiles in our present house I have started to notice all the irregularities and flaws in the tiling. We have been living in our present house for 10 years now, and I hadn't noticed anything up until now. So the message seems to be - one of two millimetres of error, here or there - is not noticeable to the human eye. Ross from next door dropped in for a few minutes and he also reinforced this message. I had arranged for a friend, Ian, to drop in and visit us on site today. He turned up shortly after Linda left. I was halfway through a bucket of adhesive when he arrived and had to push on with the job for a little while. Ian gave me similar advice to every one else - in fact, he thought that scraping the adhesive out of the gaps between the tiles was a bit unnecesary. However, I will still persist with this as I really want a deep bedding for any grouting material. We stopped for an hour to have a coffee and to talk about life in general and solved the world's problems. After Ian left, I pushed on until 8.30 pm taking the total number of tiles laid to date up to 52. I think I have now broken through my fear of tiling and I should be able to work on my own, on this job, from now on. I can see that there are still many weeks of work left to do - another two weekends to lay the laundry area and probably one weekend to lay the bathroom. Then there is wall tiling for the shower and splash backs. Also, probably another couple of weekends to install the kitchen and then get the plumber to visit.